We suggested last July that Crop Circles held Timeline Clues and based on our comments our Emissary Nancy tried her hand, coming up with dates from late October to late November for the issues the Crop Circles were warning were about to materialize. What has emerged, only recently, to confirm these predictions? The first hint was that the influence of Planet X supplanting the Suns influence as the dominant magnet the Earth listens to would increased. Nancy interpreted this to be a percentage increased until it reached 90% by Nov 23, due to Planet X moving up to the Ecliptic to essentially stand between the Earth and Sun. Has this occurred? 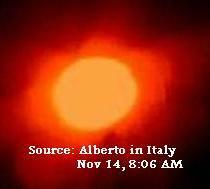 We would point to the photos of a long time photographer, from Italy, whose photos have just started to capture a merged body, where at all other times they captured the dim orb of the Planet X complex as a body apart. The second hint was that Mercury would be in the vicinity when Earth tipped into the 3 Days of Darkness, going horizontal temporarily during an adjustment at the Ecliptic that Planet X would be making during its 270° Roll. Mercury, per Nancys analysis, would be in the vicinity round about Nov 8, for an Earth in a stalled orbit. Is the Earth now starting to tip her N Pole away from the Sun during an increased wobble? What are the recent reports? The wobble has suddenly increased. The third hint was regarding particle flows returning to the Sun around her middle, an increase in the buffeting from this as Planet X struggles to piece the Ecliptic and go on its way. Nancy did not know what to do with this, having no data to track, but the current solar flares during the Solar Minimum show these particle flows disturbed, having to flow around Planet X and creating blockages and voids and resulting in a ruffled Sun surface. The fourth hint suggested that the regular battering caused by the sweeping arms of the sun and resulting whiplash among the planets caught in the swirling particle flows Cupped in front of Planet X would increased. 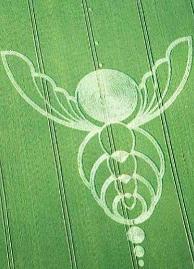 The Crop Circle analogy was a flying insect, the reverberations increasing until they became continuous. Have the battering caused by the sweeps not increased to this degree, just this month?